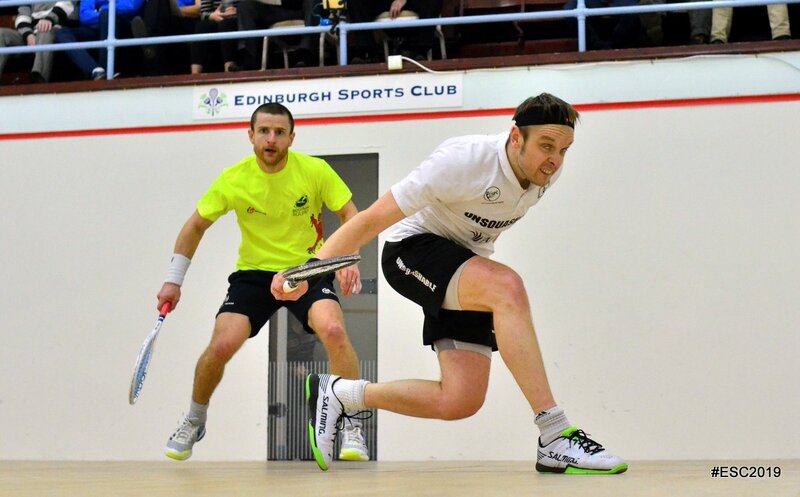 Top seeds Paul Coll and James Willstrop – both making their first appearance at the event – beat former champions Daryl Selby and Alan Clyne in contrasting semi-finals to guarantee a new Edinburgh Sports Club Open men’s champion. Willstrop took over an hour to deny Clyne, the 2016 and 2017 champion, and a brutal first game accounted for half of that time. Having taken it 16-14 Willstrop ‘hit a bit of a wall’ in the second as Clyne levelled 11-2. The third was again close, and when Willstrop took it 11-9 it felt decisive and so it proved as the Englishman established a winning lead in the fourth, before holding off a Clyne comeback to end a run of three Scottish champions. Selby has won the event five times and is well accustomed to ESC’s atmospheric Court Five, but tonight Kiwi Coll, the new world No.6, took an early lead in the opening game and held Selby’s courtcraft in check as he won in straight game, accelerating through the third. The PSA Challenger 20 women’s final will be contested by the top seeds after impressive semi-final wins by Olivia Blatchford Clyne and Hania El Hammamy at Edinburgh Sports Club on Saturday evening. Blatchford Clyne was up against England’s unseeded Rachael Chadwick, who had produced the only two seeding upsets in the draw to reach this stage. Her run was ended though as the American #2 raced to a three-nil win in just over half an hour. From 3-all in the first Olivia didn’t concede another point, and established good leads in each of the next two. In both Rachael closed the gap but couldn’t quite get on terms as Olivia closed out the match. “Rachael appeared out of nowhere for the World Juniors in Chennai 09 and you could see she was a bit different, and very effective,” said Olivia. “She’s had some good results so I knew I had to be onto it from the start. I’m just pleased to win and especially pleased to make my first final since Colombia two years ago. Second seeded Hammamy, the newly re-crowned British Junior Open Under-19 Champion, was in devastating form against Alexandra Fuller, the South African falling behind early in each of the three games and never able to catch up as Hania piled on the pressure and kept the flow of winners rolling. “I played Alex three years ago and it was tough, so I knew I had to be sharp from the beginning,” said Hania. “I’m pleased with how i played, I had a game plan and I’m glad I was able to stick to it and not lose focus. Edinburgh Sports Club Open 2019, Edinburgh Sports Club, Edinburgh, Scotland. Report by STEVE CUBBINS. Edited by ALAN THATCHER.